6 PRISON VISITS Since the spring of 1974 students from the Chicano Indian Cultural Center here in Iowa city have been making monthly visits to the Fort Madison prison. At that time Indians and Chicanos within the prison let us know that they wished to start a center for themselves. working together, the CIACC and the people in the prison started the American Indian Chicano Cultural Center which will soon be a year old. In September, 1974 the warden of the Ft. Madison prison (Lou Brewer) approved the use of a new application form for volunteers going into the prison. This form was interpeted by many of us as an invasion of privacy (the form, when signed, allows the Iowa State Penitentiary to conduct a background check of any criminal history and it also allows a check of both local and FBI records). After too many hassles, the Center here is able to get the people that want to go in, in, but the form must still be filled out. In the past our visits have been monthly. The work we hope to get done demands that we be able to get together more often so recently a new position at the House was created -- Prison Visit Coordinator. Darlene Wind will be taking over that job and hope to expand the program so that we can go at least twice a month. This is a very heavy type job and requires the support of the whole house. Many of us who have been into the prison know how vital the help we can offer is to the prisoners. We should all try to make it more often. 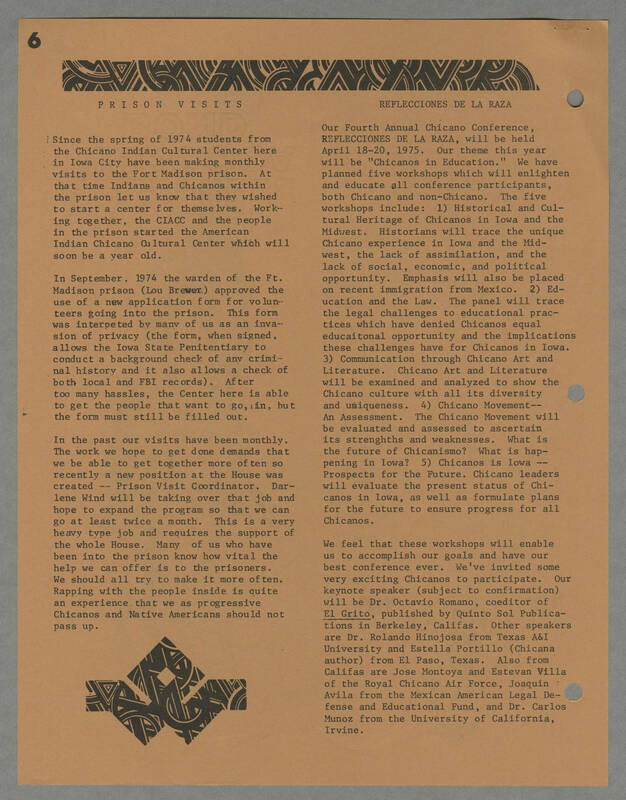 Rapping with the people inside is quite an experience that we as progressive Chicanos and Native Americans should not pass up, REFLECCIONES DE LA RAZA Our Fourth Annual Chicano Conference, REFLECCIONES DE LA RAZA, will be held April 18-20, 1975. Our theme this year will be "Chicanos in Education." We have planned five workshops which will enlighten and educate all conference participants, both Chicano and non-Chicano. The five workshops include: 1) Historical and Cultural Heritage of Chicanos in Iowa and the Midwest. Historians will trace the unique Chicano experience in Iowa and the Midwest, the lack of assimilation, and the lack of social, economic, and political opportunity. Emphasis will also be placed on recent immigration from Mexico. 2) Education and the Law. The panel will trace the legal challenges to educational practices which have denied Chicanos equal educaitonal opportunity and the implications these challenges have for Chicanos in Iowa. 3) Communication through Chicano Art and Literature. Chicano Art and Literature will be examined and analyzed to show the Chicano culture with all its diversity and uniqueness. 4) Chicano Movement-- An Assessment. The Chicano Movement will be evaluated and assessed to ascertain its strenghths and weaknesses. What is the future of Chicanismo? What is happening in Iowa? 5) Chicanos is Iowa -- Prospects for the Future. Chicano leaders will evaluate the present status of Chicanos in Iowa, as well as formulate plans for the future to ensure progress for all Chicanos. We feel that these workshops will enable us to accomplish our goals and have our best conference ever. We've invited some very exciting Chicanos to participate. Our keynote speaker (subject to confirmation) will be Dr. Octavio Romano, coeditor of [[underline]]El Grito[[end underline]], published by Quinto Sol Publications in Berkeley, Califas. Other speakers are Dr. Rolando Hinojosa from Texas A&I University and Estella Portillo (Chicana author) from El Paso, Texas. Also from Califas are Jose Montoya and Estevan Villa of the Royal Chicano Air Force, Joaquin Avila from the Mexican American Legal Defense and Educational Fund, and Dr. Carlos Munoz from the University of California, Irvine.